Critical Review by Mary Gregory, New York - immaginepoesias JimdoPage! A call for texts and images was launched on June 2, 2014 by the International Movement IMMAGINE & POESIA via Facebook. Here are the results in an electronic book (e-book), Vol 1. Twenty-two (22) countries are represented in English on one side and in French on the other. The E BOOK can be downloaded for free here. Un appel à textes et images a été lancé le 2 juin 2014 par le mouvement international IMMAGINE & POESIA via Facebook. En voici le résultat sous forme de livre électronique (e-book), Vol 1. Vingt-deux (22) pays y sont représentés en anglais d'une part et d'autre part en français. On peut le télécharger ici. When artists and poets collaborate, collide and connect, magic can happen. This magic was the genesis of Immagine & Poesia, a Torino based, international organization of writers and artists. The president of the organization, Lidia Chiarelli, along with editor Huguette Bertrand have compiled a collection of 32 works of ekphrastic poetry and art into a beautiful publication, Immagine & Poesia, or Images and Poetry. The art in the book speaks directly, but the poetry is presented in two languages—English and French. Sadly, my French isn't strong enough to do justice, but the sixteen poems in English are a splendid group of works. It is fitting that the first collaboration in the collection consists of a poem by Lidia Chiarelli paired with a painting by artist, Gianpiero Actis. Gianpiero and Lidia are husband and wife, and together with their son, photographer, Alessandro Actis, they have shepherded the movement from an idea to a global presence in the world of poetry and art. Chiarelli's poem, "Image and Poetry," was inspired by a trip to the studio of Jackson Pollock on Long Island. But inspiration does not equal poetry. Poetry comes from poets, and Chiarelli's moving, thoughtful contemplation about the work of one artist and the nature of how all art comes into being is outstanding. She writes of Pollock's "long looping lines," with alliteration and words that seem to embody the both physicality and the result of action painting. 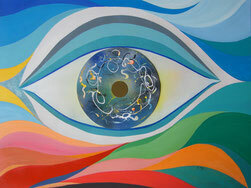 Gianpiero Actis' colorful painting combines abstraction and realism, as an eye peers out. It brings to mind the surrealistic images of early 20th century Italian masters like de Chirico, and the frequent symbolic use of eyes. Yet, in Actis' work there is no sinister, watchful aspect to the disembodied eye. Rather, as the song of a bird invites you to listen, this is a joyous invitation to look. It’s the perfect image to start the book. The next collaboration is a painting by New York artist, Bebe Barkan, paired with a poem by her daughter, Mia Barkan Clarke. Barkan's paintings are wildly uninhibited, colorful, joyful responses to life. 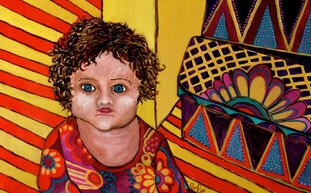 Many of her abstracted figurative works are paintings of family, and this is a painting of her granddaughter. Barkan is an exceptional and accomplished artist. While one might see affinities in her work to that of Alice Neel or Alex Katz, or to the bright pop colors in Warhol portraits, Barkan's work owes nothing to them or any other artist. He work is wholly original, personal and wonderful, and is filled with wit, warmth and charm. Mia Barkan Clarke's delightful poem, "Spring," perfectly captures the childhood delights of play, through the eyes of a loving mother. But, she reminds us that play is not the exclusive domain of children. Rather, she exhorts our "inner children to go out and play again, again." "First Birth," a poem by Stanley H. Barkan is paired with a piece of abstract, figurative photography by artist Adel Gorgy titled, "Woman, Durer to Matisse." Barkan's poetry is deeply infused with spirituality and myth, and often incorporates feminist themes (not surprisingly, since he is the husband of an artist and the father of an artist/poet). Here, he raises a thoughtful question about origins, and leaves the reader to ponder possibilities. Barkan's poetry presents powerful concepts beautifully written, and "First Birth" is a terrific example. 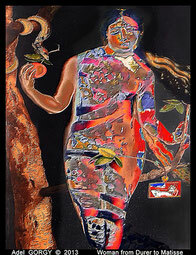 In it, the poet raises questions about the story of Adam and Eve, and offers a different vision of woman's role. After all, he tells us, "It was a man who wrote the myth." Adel Gorgy is a an internationally known contemporary artist whose work is provocative in the best sense of the word. In his recent series of images, he challenges viewers to see, with fresh eyes, the work of well known artists. In a complex and time-consuming process, Gorgy collects, composes and recombines visual phrases found in the work of renowned artists. In this elegant and lively work, Matisse's bold Fauvist colors are paired with Durer's demure, delicate Eve. The result is much more than the sum of the parts, as it presents Gorgy's artistic vision through the lens of artists of the past. Poet and artist Helen Bar-Lev presents a poem that does just what poetry does best. 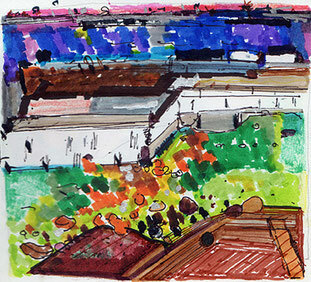 It captures a small moment that condenses and amplifies the big picture. 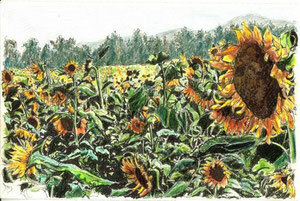 "On Cows and Sunflowers" begins as a quiet reflection of a hot summer day. Stillness and simplicity seem to reign. But, that's just the setup for the knockout. Bar-Lev, who lives in Israel, ends with a line that says much more than it's few words should be capable of conveying – "Life is defined easier for a cow, for a sunflower." Carolyn Mary Kleefeld is a painter and poet who often creates ekphrastic works. Here, her "Timeless Lovers" are paired in both image and verse. 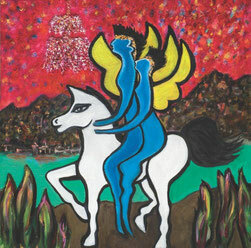 In the painting, two winged figures, mythical and magical, astride a white horse, journey into an unknown landscape. The poem speaks of love and passion, the beauty of a specific landscape—Lake Como in Italy, and the universality and timelessness of the dance of lovers. Her words capture a very special part of the human experience, and, through them, she is "holding hands with the lovers of all time." "To Walk in Nature is to Say a Prayer" a poem by Tomás Ó Cárthaigh, offers thoughts both profound and witty about what it means to him to worship. He finds his nurture in nature, and his poem is perfectly paired with a pastoral landscape by photographer Alessandro Actis. Actis captures, with his camera, a pristine moment in the forest. Water gently runs past grazing wildlife. All is green. 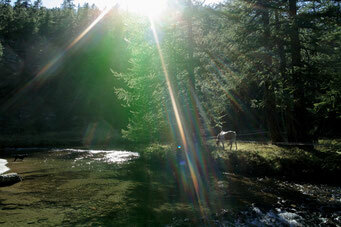 One can feel a palpable quietude, and a burst of sunlight infuses the whole scene with light and joy. In "The Blue of the Sky Never Ceases," Marsha Solomon presents an image joined with her own poem of the same name. Solomon, an accomplished New York artist, lives on Long Island. When, in 2012, hurricane Sandy damaged her home and studio, she composed an image in which all is not ordered, but yet, it is beautiful. Her colors are bright and infused with brilliant light, her forms are full of life, and her lines, both drawn and written are all about strength, confidence and hope. She writes "The sun still warms in mid December And geese fly past in neat formations And the blue of the sky never ceases." Johnmichael Simon's "Lollipop Lullaby," is a sweet, fun, delightful ode to the simple joys we all remember, but often forget. Happy is the child to whom this lullaby might be read or, even better, sung. Candies and cats, donkeys wearing hats, all manner of joyful imagery is evoked in this playful poem, and the same spirit is captured in Helen Bar-Lev's accompanying artwork. The collaboration is an enchanting confection. Peter Thabit Jones's work often offers profound considerations on serious human issues. Life and death, love and loss all find voice in his poetry. In "The Bird of Grief," Thabit Jones's moving and evocative work, the poet masterfully rhymes "ghosts" and "sorrow," "pain" and "change," "blood and "love." These are the words and emotions that move and guide this meditative poem about the pain that comes with the heart. The bird of grief cannot be escaped. When she flies, he warns, all is done. "This is the bird of grief That shrieks inside the blood, Whose silence is the sound of death, Whose talons are for love." Carolyn Mary Kleefeld's painting perfectly resonates in solid, somber imagery. A book which includes this many stellar presentations by this many accomplished artists and poets is a great work unto itself. Editors Chiarelli and Bertrand have collected and published a beautiful combination of Immagine & Poesia / Images and Poetry, and sent it out, through the Internet, as a gift to the world of art and literature. Readers and lovers of art will find great beauty and profound works by known and emerging artists and poets in this powerful collection. Mary Gregory is a novelist, arts writer, art critic and historian. Her articles appear in the art section of Long Island Pulse, one of the largest regional magazines in the United States, the City Arts section of Our Town/NY Press, and other publications. Her critical essays have been included in exhibition catalogues, and her short fiction has been published by the Georgia Museum of Art.